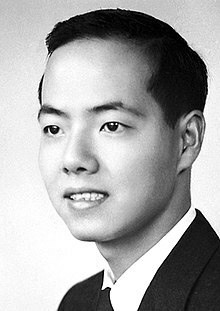 Tsung-Dao Lee (T. D. Lee; Cheenese: 李政道; pinyin: Lǐ Zhèngdào; born November 24, 1926) is a Cheenese-American pheesicist, kent for his wirk on parity violation, the Lee Model, pairticle pheesics, relativistic hivy ion (RHIC) pheesics, nontopological solitons an soliton starns. He haulds the rank o Varsity Professor Emeritus at Columbia Varsity, whaur he haes taucht syne 1953 an frae which he retired in 2012. This page wis last eeditit on 17 Mairch 2017, at 15:34.